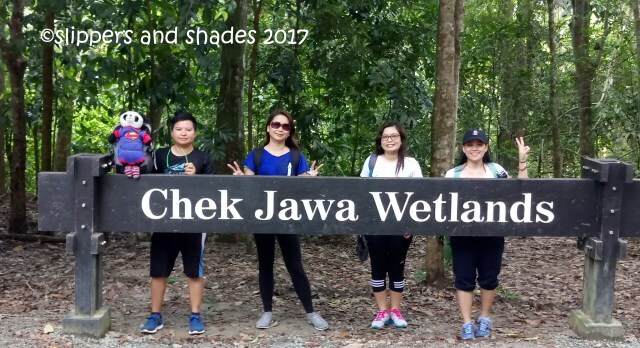 Chek Jawa Wetlands or Tanjung Chek Jawa is the most popular tourist destination in Pulau Ubin and the highlight of our trip. The 100-hectare cape is located on the eastern tip of the island and is about 3 kilometers away from the public jetty. What makes it unique is that it is home to several ecosystems found in one area-the sandy beach, mangroves, seagrass lagoon, rocky beach, coral rubble and coastal forest. Indeed Chek Jawa Wetlands is unusually rich in biodiversity. Check Jawa Wetlands is an intertidal area where the perfect time to visit is during the low tides of 0.5 meters and below for a chance to see their rich ecosystems. To avoid disappointment, do refer to the tide table when planning your visit. According to Wikipedia, intertidal referred to as the littoral zone that is above water at low tide and under water at high tide, in other words, the area between tide marks. 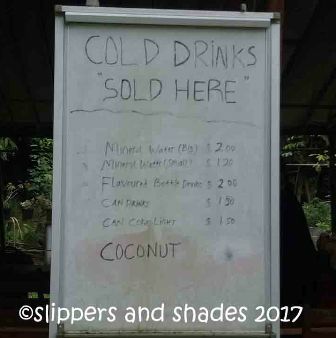 Chek Jawa can be reached by hiring a local van for SG$35 or renting a bike at Kampong Ubin (near the entrance) from S$8.00, S$15.00 or S$25 depending on the style or condition. Just be reminded that it is not allowed on the Boardwalk. Park and lock your bike near the Punai Hut. 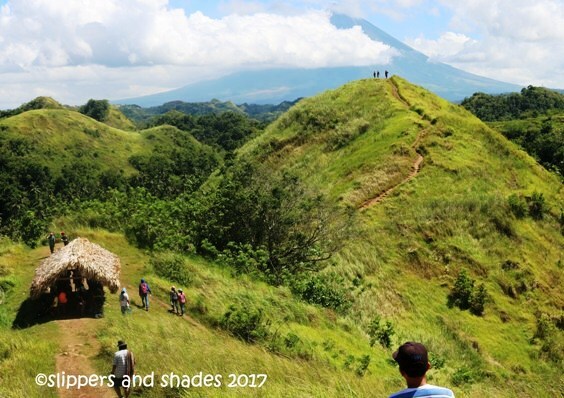 If you want a dose of adventure, walking is the best for you. 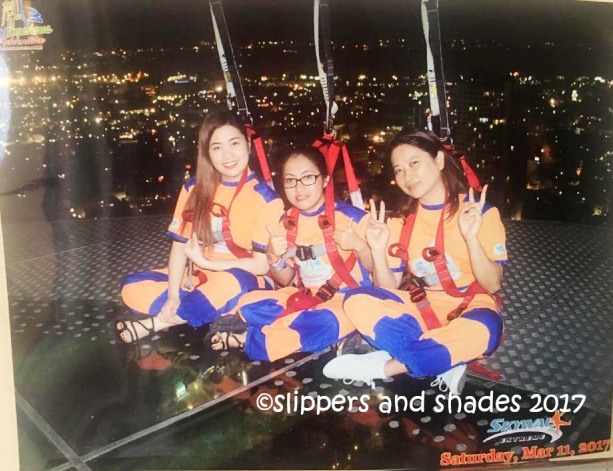 As for me and my new found Pinoy friends whom I met inside the bus-Richel, Mavie and Pinky, we opted to take a walk. We visited Butterfly Hill, Sensory Trail, Pekan Quarry and our last stop is in Puaka Hill. From there we set out to continue walking to Chek Jawa Wetlands. It was fun walking on the paved road because of the lush greenery and peaceful environment. 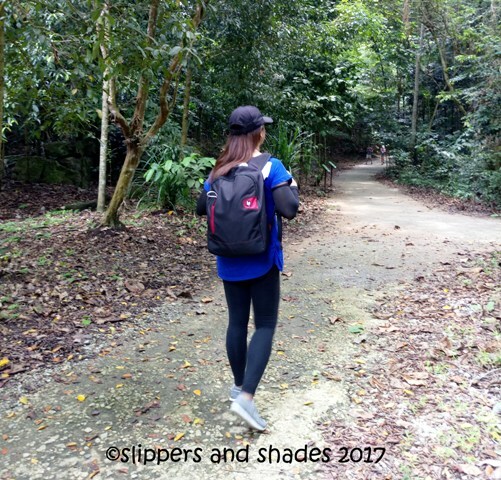 Who would have thought that a highly urbanized Singapore managed to retain and safeguard the island’s natural heritage? Amazing! It is Sunday today and I was so happy to see many bikers on the road. There were adults, young and even little kids. 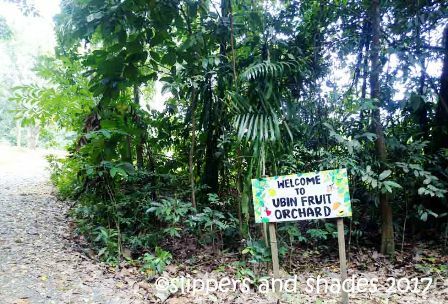 We passed by the Ubin Fruit Orchard along Jalan Ubin. The fruit tree arboretum about one hectare in size planted rambutan, durian and starfruit. A moment later we passed by a little store and stopped to buy cold refreshments. They were so kind that they allowed us to use their restroom free of charge. Not all roads leading to Chek Jawa are paved. Few steps from the turnoff, the road was surfaced by gravel where some portions had patches of water. This is the most challenging part for the bikers. The road was one-way and some parts were steep. There is signage to dismount on a downhill part. It’s best to follow the rules to avoid an accident. Along the way, we came across dogs, monkeys and wild boars. 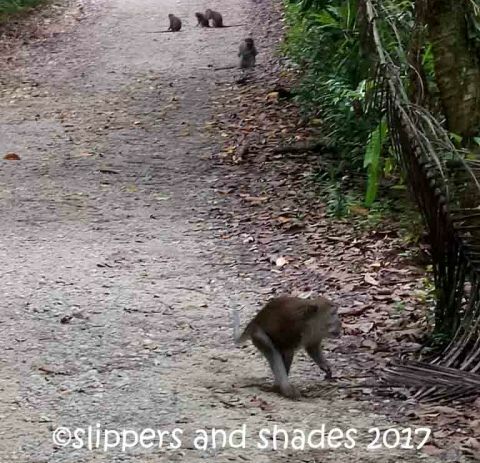 There were monkeys scattered on the road. It is advised not to provoke these primates because they might attack you. One of the monkeys looked at me straight to the eye and later it followed me humming an unusual voice. Pinky dismissed it by waving her hand then I slowly walked away. The monkey ran away from us. Wild boars were so tame. A sow and its young were roaming around everywhere. They don’t mind if they were being taken a picture by lots of curious visitors. In a little while, we reached the entrance to Chek Jawa and headed to Visitor Centre. Information Kiosk, rules and guidelines, concrete benches and a vending machine are found here. This is a nice place to stay after biking or walking. This Tudor-style bungalow and the nearby outhouse were built in 1930 by the chief surveyor, London William for a holiday or weekend retreat. 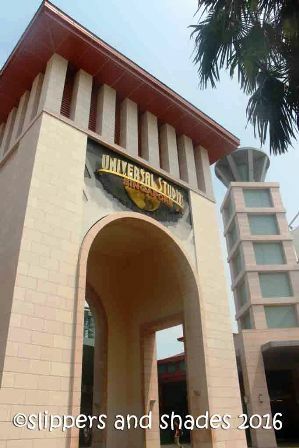 The architecture behind and its historical significance to Singapore attracted many tourists to visit the place. Aside from the house, there is the concrete jetty that extends about 100 meters to the sea and towards Pulau Sekudo or Frog Island. 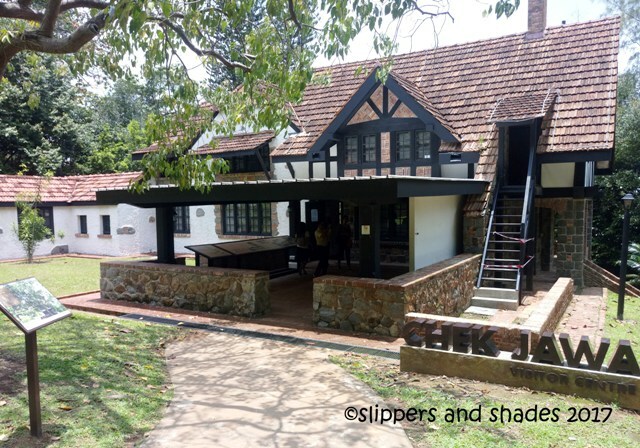 Restoration had taken place and original materials were used to preserve the architecture behind it. How I wish I have a rest house like this where I could sit near the sea to contemplate on many things or take a quiet walk along the concrete jetty. House No. 1 by the way, is the postal address in Pulau Ubin. 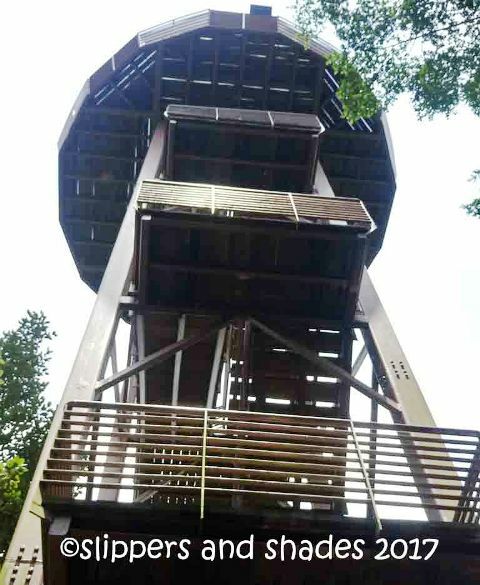 Standing at 21 meter high is a seven-story viewing tower where a panoramic view of the lush canopy of trees can be seen. It was so wonderful to stand a while at the viewing deck while looking at the awesome sight and the birds flying nearby. Only twenty persons could accommodate the viewing tower at a time. Be patient waiting for you turn. 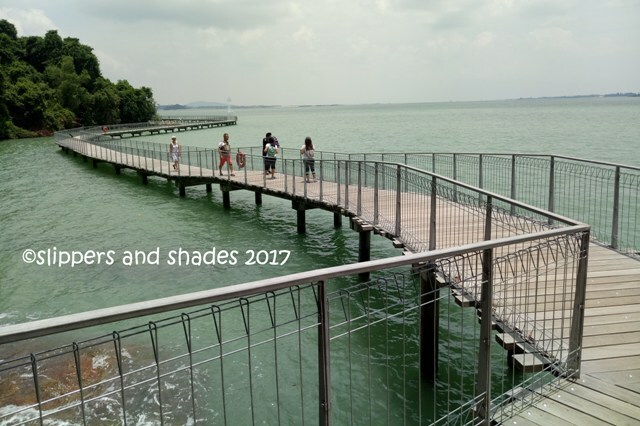 They say the best part to see and enjoy the beauty of Chek Jawa is to take a stroll along the 1.1 km Boardwalk which is divided into Coastal and Mangrove Loops. 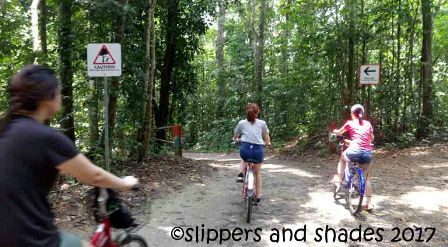 For venturesome people who want to explore more of Chek Jawa can access both routes. But for us, we chose the latter to minimize time travel because afterward each one of us will visit other places on the mainland. The time we stepped into the Boardwalk the water had engulfed the entire beach area. We were deprived of seeing the animals like Fiddler Crabs, Pistol Shrimps, and Barnacles. Anyway, we have to move on to enjoy walking on the boardwalk while savoring the beautiful view. Along the way, there were educational boards telling what plants and animals can be seen in the area. It was flickering hot so we walked fast to avoid the heat. Halfway there was a rest station where we paused for a while to quench our thirst with water to avoid dehydration. 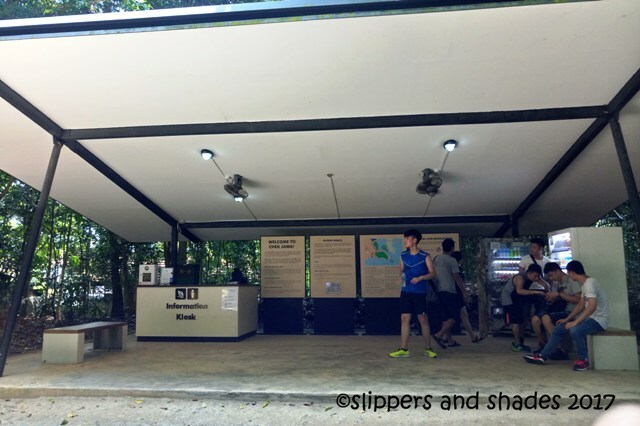 On June 4, 2016, National Parks Board was designated as the central managing agency for Pulau Ubin at Ubin Day 2016 by the Guest-of-Honor of the event, Minister Lawrence Wong. They are responsible for the maintenance of most aspects of the island, maintaining its greenery, the recreation for the public, education and research as well as the licenses issued to the community. It’s good that there is an agency like this who will surely keep the island clean, green and safe for the residents and to the visitors as well. 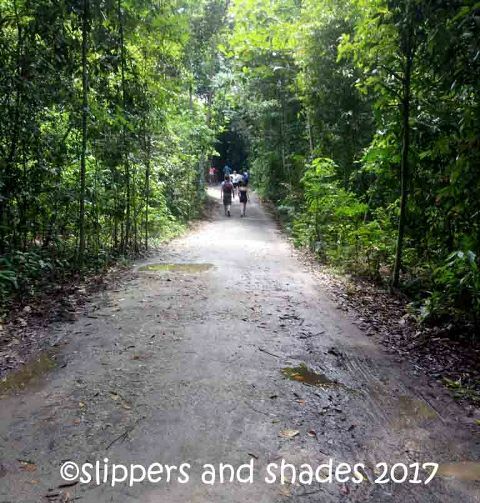 Coming from an awesome adventure at Chek Jawa Wetlands, we took the Jalan Durian route in getting back to Kampong Village. The trek back was easier and seemed shorter. We made it for about 45 minutes only. We were all famished when we reached a seafood restaurant Season Live Seafood Restaurant facing the mainland Singapore and the Ubin Jetty. As we browsed on the prices of the food we found out it was a bit pricey. My buddies decided to eat at Hawker Centre at Changi Village. It’s time now to say goodbye to my new found friends. I thanked them for the unforgettable journey we had in Pulau Ubin. I decided to stay for I haven’t fully enjoyed exploring the island. I went to the picnic area near the sandy shore and ate my packed lunch. There were several people having a picnic there. 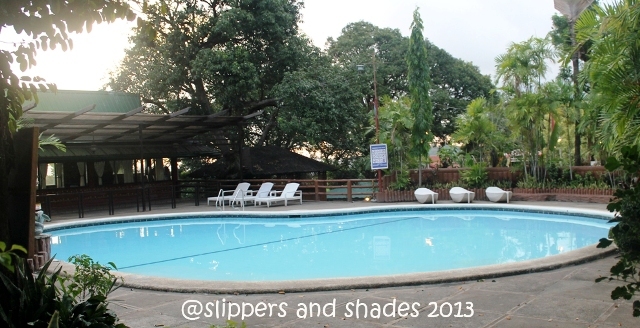 I felt I was in the Philippines because of the serenity and tranquility defined in that area. After I had my fill, I breathed deeply of the lovely afternoon air and let the beauty of the island sink into my consciousness. I listened to the silence of the place and to the friendly waves. I was savoring the gentle wind brushing gently into my face. This is a wonderful quiet moment. 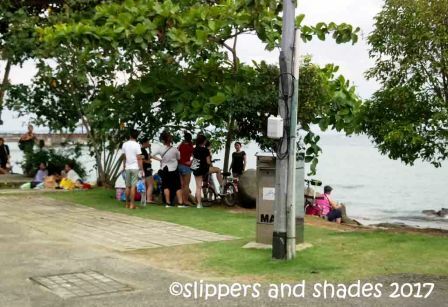 I enjoyed watching the bumboats go back and forth to Changi Point as well as the airplanes hovering in the sky. I went back in time and saw how life was in those days on this Island. 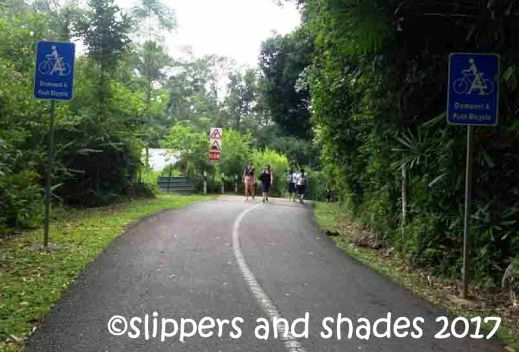 This was a rewarding experience for I had gained a deep understanding of Pulau Ubin. The journey to the olden times was beyond compare. After I regained my energy, I went to Nature Gallery and started reading about the rich history of Pulau Ubin. 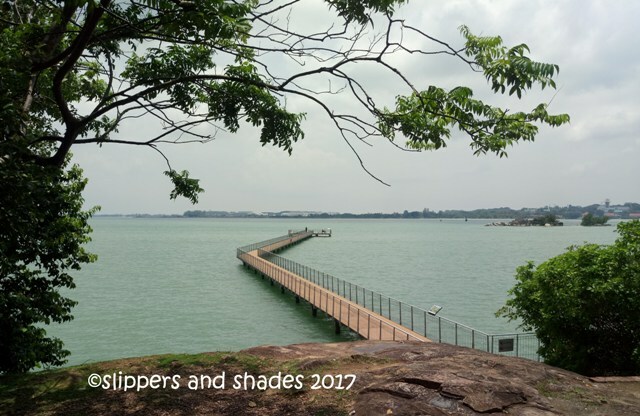 Then later I went back to Ubin Jetty and bid goodbye to what has been said, the last frontier of Singapore. My next destination -> Gardens by the Bay, the Flower Dome and Cloud Forest. You may download the map here. 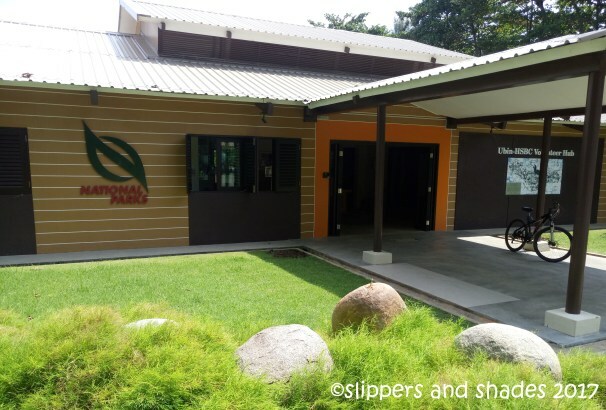 If you want to savor the lush greenery of the island, it’s better to take a walk in getting to Chek Jawa Wetlands. 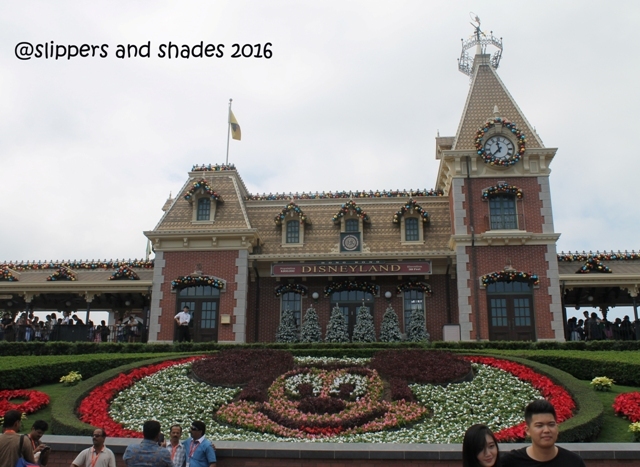 Singapore is a tropical country, expect it to be hot so wear comfortable clothes, shoes and also bring hats, sunglasses and arm warmer. Apply sunblock for there are portions of the roads exposed to sun. Apply also mosquito repellant for there are gnats and mosquitoes to some part of the island. Water in the public toilet is not potable so it is advised to bring at least two liters to avoid dehydration. Biking is safe but be sure to check the bicycle if it’s in proper condition, wear a helmet and follow the road signs. Take it slow during downhill and if possible dismount on the uphill portion to avoid an accident. For a solo girl biker, it is advisable to go to the island on weekend for your own safety because there are lots of people on the road during those days. 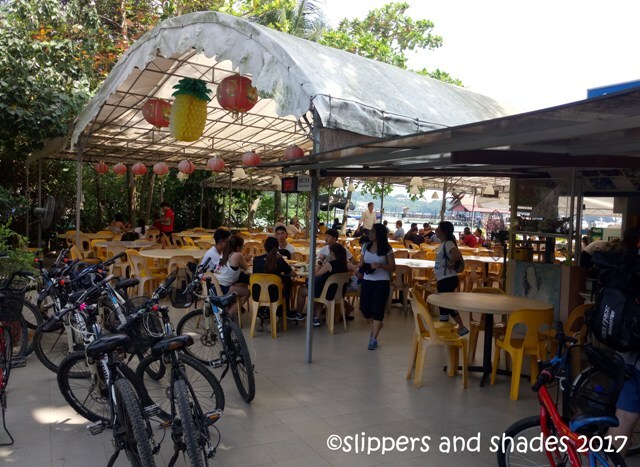 Food and drinks are a bit pricey on the island compared to the Hawker Centre in Changi Village. It is advised to bring food, snack and water because there is only one store along the way to Chek Jawa and sells beverages only. Do not feed the animals nor provoke them. 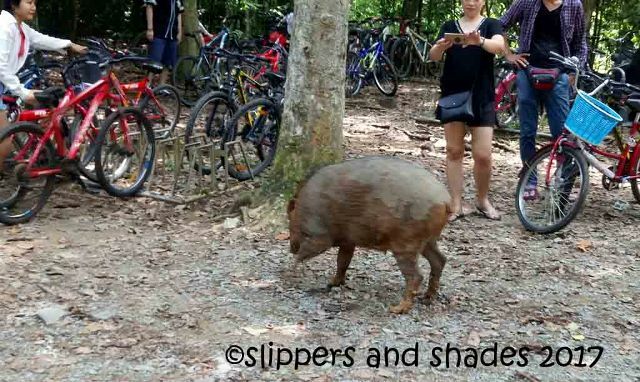 Stay calm and walk away slowly when you encounter a wild boar or a monkey. Do not use flash photography when you take pictures of the wild boar because this may upset them causing them to be aggressive. In case you encounter monkey, put all your things inside your bag because some of them are playful. They hastily grab things which attract their attention like water tumbler, monopod and sometimes even the bag is being taken away. For your safety, stay away from the edges of the river, cliffs and granite quarries. If walking, stay always on the left so as not to obstruct the others especially the bikers because some of them were in a group. Take good care of the facilities so that the others can enjoy using it. There is no wifi signal on the island. Appreciate the beauty of the island, the sound, the wildlife, the stillness and its rich biodiversity. Leave nothing but memories. Take nothing but pictures.